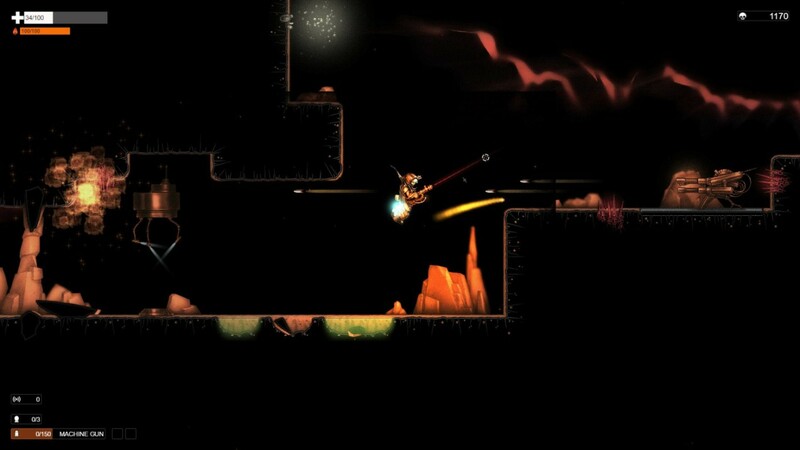 Orange Moon is a 2D action side-scroller from developer Betelgeuse Zero and published by Meridian4. It uses a simple graphic style that relies on high contrast black and orange imagery and animations that would look more at home in early 2000s flash game. The music and sound are there to try and give the game a creepy vibe, but it barely manages to pull that off. The controls are clunky, the gameplay is basic, and there is no enemy AI to speak of. The nicest thing I can say about the graphics is that they give me a nostalgic feel for the many hours I spent wasting time on Newgrounds in high school. The art design is bland, the character designs are unimaginative, and the animations are akin to what you’d see in an episode of South Park. The graphics are clear and easy to read, so you won’t get lost in the action, but the lack of design originality really hurts the game. 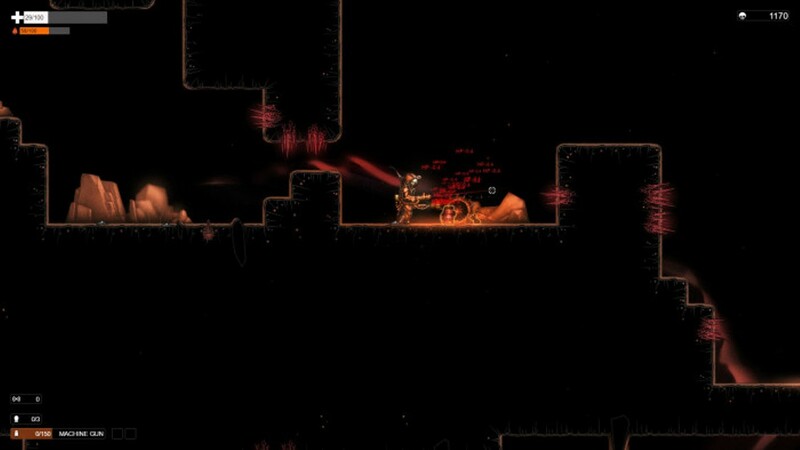 Orange Moon’s sound design does it’s job and little else. The guns sound like guns but they don’t have enough bass to them to be satisfying to fire. The explosions sound a little hollow and all the sounds have the treble up just a bit too high, giving everything an airy quality. Maybe it was intended to give off the feel of a planet without atmosphere. The gameplay reminds me of late 90s mouse-driven action shooters, but not in a good way. You aim with the mouse and move with WASD, but the mouse aiming has a minimum and maximum height that feels very restrictive and causes the entire aiming system to feel extremely clunky. Usually, you would expect your bullets to go where your mouse is pointing, but due to the minimum and maximum height restriction your bullets tend to go a little high or a little low. There is no enemy AI to speak of. Enemies either just fire constantly in a pattern or they move toward you in a pattern before locking on and smashing into you. This all combines into a gameplay experience where I found the best tactic was to try and exploit movement patterns by moving into areas where I could not be hit. This lead to very unsatisfying kills or dying to a barrage of weak enemies who only got to me because my gun wouldn’t fire where I was pointing. Orange Moon is a game in a genre that I like, but I cannot recommend it at this time. At a price point of $11 CAD there is not enough here to hold my interest and what is here just doesn’t feel enjoyable to play. We will see what happens with development in the future as the creators are still making lots of changes.